Everyone – well, almost everyone – likes to send cards to their friends and family in festive season, but for an increasing number of people there is an issue of what they should say. I don’t mean the bit you write yourself - the message of love and best wishes from you to whoever you are sending the card – I mean the printed words on the front or inside the card. The problem is that the traditional “Happy Christmas” doesn’t feel quite right for many who aren’t even nominally Christian. As a pagan, I love to celebrate the midwinter festival – it is one of my favourite times of the year. I call it Yule or the Winter Solstice rather than Christmas, because I celebrate the turning of the Wheel of the Year. For me this holiday – as well as being a chance to get together with family, eat too much and exchange gifts – marks the time when the longest night of the year passes on 21 December and by 25 December the days have just begun to get noticeably longer. The rebirth of the sun in the northern hemisphere is more important to me than the official anniversary of the birth of the baby Jesus in Bethlehem. That is why I feel a bit hypocritical and embarrassed if I send out cards that say “Happy Christmas”. The most common alternative is “Season’s Greetings”. It’s OK. It’s completely neutral. The problem is that many people who get sent cards with that message feel it is a bit cold and impersonal. And, to be honest, in the past most of the pictures on cards that said "Season's Greetings" were also a bit cold and impersonal – photos of chilly landscapes or classic paintings of shivering peasants usually, a stylised poinsettia if you were lucky. Things have got a bit better in recent years. 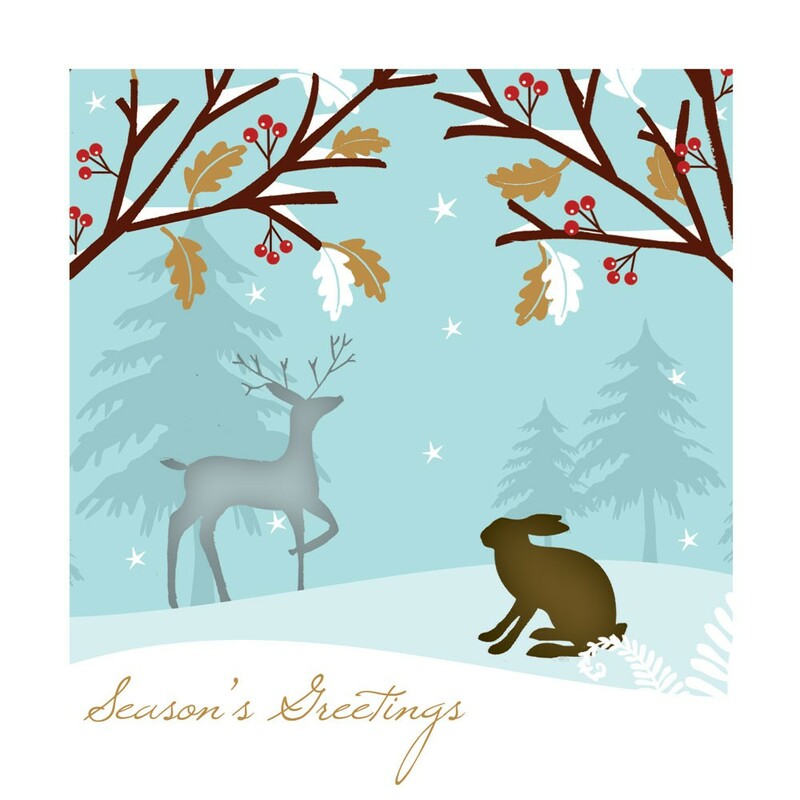 Nowadays there are often some delightful Seasons Greetings cards with stags or other winter wildlife to be found – such as the lovely Enchanted Woodland card from charity the RSPB pictured above right. But you have to search quite hard to find anything nice. If you want cards that specifically say something like “Merry Yule” or “Happy Winter Solstice” then you can find them. More and more are being produced by small pagan companies. Yuletide Angel, in the lower right picture, has artwork by Anne Stokes and inside has a faded image of a candle with a dragon curled round its base, and the text "Yuletide Greetings" over the candle's flame. 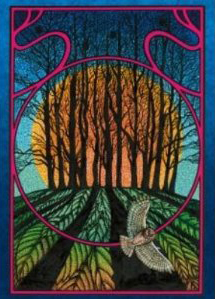 There are also some nice Winter Solstice cards that you can order from pagan suppliers through Amazon – including the Winter Solstice Sunrise Tree that you can see pictured left. These cards are printed on something called "tree free paper" that is meant to be environmentally friendly, which is nice. I haven't seen these cards in person, and the description says that they either have a themed message inside or no message at all. I'm not totally sure what the themed message says or how you would choose between one with a message or a blank card. Personalisable cards are an increasing trend. There are quite a few online card retailers that allow you to pick you own image and message to create exactly the card you want. Moonpig has quite a few customisable Yule cards with humorous pictures that certainly aren't cold and unfriendly. I think personalised cards are a very nice idea for someone special, but probably too expensive if you want buy a large number of cards to send out to all your friends, work colleagues and distant aunts and uncles. I’ll probably go for cards sold in aid of charity again. I do feel that it is good to support a cause at this time of year. If anyone knows of any pagan charities selling Yule cards, do let me know. I contacted the Woodland Trust (an ideal place for Pagans if ever there should be one) and asked why they have Merry Christmas on all their cards. Apparently they tried seasons greetings and people complained. I buy RNLI cards now, and stick a label over the bit on the inside that says Merry Christmas. Then I write my own message over the top. Shame the Woodland Trust couldn't even produce blank cards suitable for your own message. Labels are a good idea.